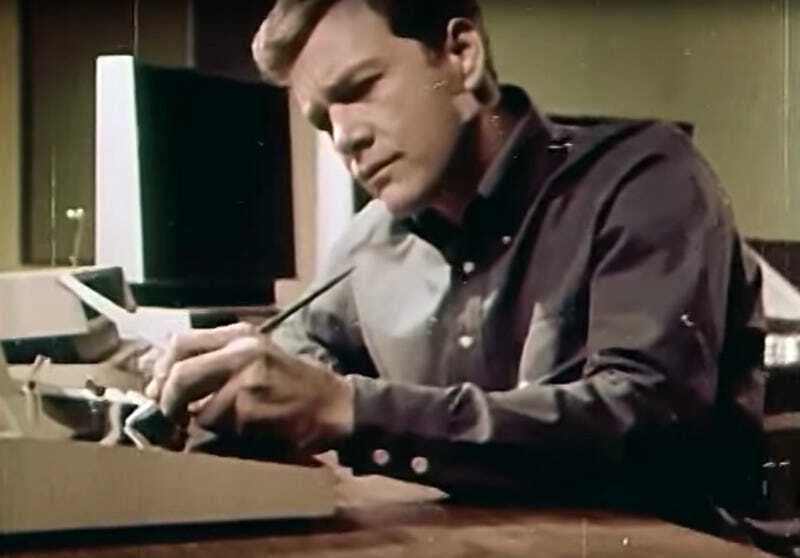 Wink Martindale doing online banking in the 1967 futurist film 1999 A.D.
Do you remember that short film from 1967 titled 1999 A.D.? The film, produced by Philco-Ford, shows off the house of the future, complete with videophones and push-button kitchens. It was doing the rounds back in 2007, when I first posted a clip of it. Well, one of the stars of that obscure futurist film has officially endorsed a candidate. And it’s the candidate who wants to destroy the future. Wink Martindale would become best known as a game show host in the 1970s and 80s, running a show called Tic Tac Dough. But before that, Martindale did a short film that imagined what the house of the future would look like. The video had everything, including online banking, automated kitchens, computer lesson plans, and jet-setting luxury vacations. Legendary news anchor Walter Cronkite even visited the house for a 1967 episode of his CBS show The 21st Century. But now Martindale’s vision of the future is more retro than futurist. If you saw Wednesday night’s episode of The Daily Show you may have noticed a segment about the Trumpettes—wealthy women in Bel Air, California who are supporting Donald Trump. Martindale made a brief cameo in the episode supporting the Trumpettes and Donald Trump’s backwards vision of tomorrow. Trump has really racked up the celebrity retro-futurist endorsements recently, including that Baldwin brother from BioDome and the weirdo who pulled a gun out of his chest in Videodrome. And now, with Martindale making his support known, it’s clear that Trump is locking up the paleofuturist vote. If you’ve never seen it, you can watch the entire film below. Ironically, if Trump and Martindale have their way, America’s future will probably look a lot more like the darker parts of our past in innumerable ways. But with any luck, we’ll soon be able to imagine the dystopian world of a Donald Trump presidency as ridiculous. If the American people ignore the advice of people like Martindale, the idea of a President Trump will hopefully return to being one of those silly futures that never was.